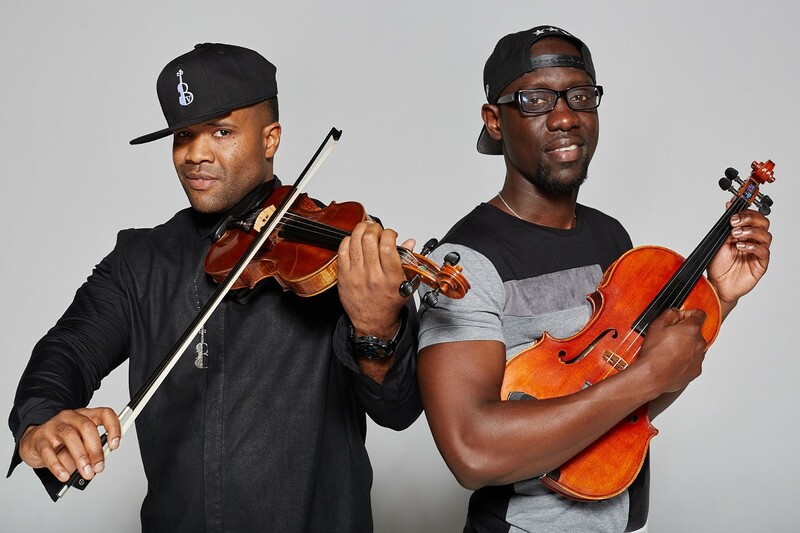 Breaking down stereotypes and cultural barriers is an underlying theme for Black Violin, a classical-meets-hip-hop duo co-fronted by classically trained musicians Kevin “Kev Marcus” Sylvester (violin) and Wilner “Wil B” Baptiste (viola). After graduating from Dillard High School in Fort Lauderdale, the pair parted ways for college but later reconnected and bonded over shared musical influences, including Chicago soul pioneer Curtis Mayfield and jazz hero Stuff Smith. Borrowing their name from an album Smith released in 1965, Black Violin scored an early breakout by winning Amateur Night at the Apollo, charming what Sylvester dubbed “the hardest audience on the planet” with classically informed renditions of Notorious B.I.G.’s “Juicy” and Michael Jackson’s “Rock with You.” Since that pivotal moment, Black Violin has released three full-length albums (2008’s Black Violin, 2012’s Classically Trained and 2015’s Stereotypes), collaborated with Kanye West, Alicia Keys, Wu-Tang Clan and Wyclef Jean, performed for the Obamas at the Kids’ Inaugural Concert in 2013 and joined Turnaround Arts, a nonprofit initiative bringing arts education to schools in underserved communities. Often going beyond the core ingredients of classical and hip-hop to concoct what they’ve called “a melting pot of music,” the duo truly shines in a live setting, mixing up unexpected covers and original material with support from percussionist Nat Stokes and turntablist DJ SPS. Like rock concerts appropriate for kids, grandparents and everything in between, these live shows exemplify Black Violin’s mission to bring diverse audiences together and inspire people to look at things from new perspectives. An excellent primer, the Black Violin YouTube channel chronicles both greatest hits (including the early favorite “A Flat” and the Black Lives Matter tribute “Stereotypes”) and oddities such as a “flip” on the Stranger Things theme song and a mashup of Mozart and Cardi B backed by the National Symphony Orchestra.